With its great sound, simple interface and add-on packs, Pianoteq 3 is a genuine alternative to sample-based solutions. …but you have to pay for them. No upright model. 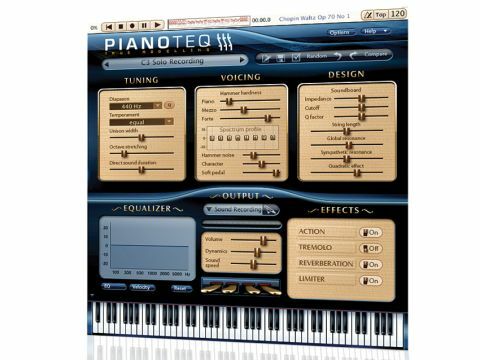 When the first version of Pianoteq arrived in 2006, it broke the conventional mould. At that time, all of the high-spec virtual grand pianos were sample-based, but Modartt's software generated its sounds in real-time, giving it several distinct advantages. For starters, the hard drive footprint was tiny - 20MB as opposed to tens of gigabytes - and RAM demands were correspondingly low. The developer also pointed out that, while the sound of samples is inherently 'static', a modelled instrument can more easily react to how it's played. Loading times were fairly instant, too. These same benefits apply to v3, which runs both standalone and as a plug-in (there's even a Linux version) and adds several fresh strings to its soundboard. Most notable among these is the new acoustic model, which gives you the ability to position up to five mics around the piano and raise/lower its lid. The mics can be mixed over a maximum of five output channels, and for headphone use, there's a handy binaural mode - instead of moving mics, you can adjust the position and even the size of a virtual head. More immediate gratification comes in the form of two new grand piano models: C3 and M3. The C3 is the warmer of the two, making it better suited to classical music, while the harder M3 works for more contemporary styles. Both sound terrific and are engrossingly enjoyable to play, rendering any argument over whether it's possible to effectively model a piano redundant. The only slight disappointment is that there isn't an upright model included. Each piano comes with several presets that take advantage of the new acoustic model, and you could get your money's worth from Pianoteq 3 without ever going beyond them. However, should you wish to create custom instruments, you're given ample opportunity. "The new acoustic model gives you the ability to position up to five mics around the piano and raise/lower its lid." As before, Tuning, Voicing, Design, Equalizer, Velocity Response, Output and Effects sections are all available, each containing relatively self-explanatory parameters. New to Pianoteq 3 are the Tremolo and Limiter effects, the former being particularly useful when combined with the new electric piano and vibraphone instruments. We tested the Rhody R1 and Wurly R1 sounds from the optional Electric piano expansion pack (you probably don't need telling which instruments they're based on) and they certainly don't stretch the software beyond its potential. They're very authentic, in fact, although they don't quite trump those in Devine Machine's sublime OTR88. Additionally, we tested the Vibes add-on, which provides a couple of eminently usable vibraphone models, and you can get your hands on the YC5 Rock piano, too. The add-ons are certainly a selling point for Pianoteq 3, but we can't help feeling that Modartt has missed a trick by not including the Electric piano bundle as standard. This would have made the software's not-inconsiderable price all the more palatable, and the company would have been able to market Pianoteq as a one-stop acoustic/electric piano solution. If Pianoteq wasn't quite the finished article back in 2006, it certainly feels like it now. It sounds and looks better than ever (the interface has been given a bit of spit and polish) and the aforementioned advantages that stem from it being modelled rather than sample-based simply can't be ignored. Factor in the ability to expand the product with both acoustic and electric sounds (in addition to the commercial add-ons, there's a range of free ones) and you've got what feels like the most attractive piano software currently on the market.